In Porto, like most European cities, cultural dimension and cultural activities have become increasingly important in recent years. Simultaneously, incubators became a way to promote creative business and support creative entrepreneurs, aiming at the local economic development. 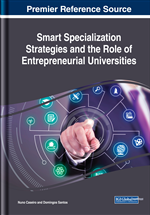 This is also recognized in academic institutions that boost academic third mission with, among others, the local positive cultural dynamics, responding to the domains of smart specialization defined to the northern region of Portugal. City center of Porto is, because of its centrality, where the expression of cultural and creative dimension assumes particular contours, being more concentrated and effervescent. In this chapter, the authors present the UPTEC PINC. For it, a methodological approach that combines qualitative and quantitative methods, namely interviews of the executive manager and start-ups installed in PINC and analysis of statistical indicators, is used. This chapter develops two main themes. On one side, it stresses the role of entrepreneurship, and particularly academic entrepreneurship, in urban contexts currently; and on the other side, it contributes to debate around the importance of cultural and creative start-ups to urban economic development. Over the past two decades there has been an increased number of studies around entrepreneurship and entrepreneurs (Bosma & Sternberg, 2014). Entrepreneurship is recognized as having a positive effect in local economies by generation of economic activity and creation of jobs (Audretsch, 2015; Castaño, Méndez, & Galindo, 2015; Galindo & Méndez, 2014). University is one of the main sources of innovation (Etzkowitz & Leydesdorff, 2000) and together with R&D centers, science and technology parks and other innovation milieux, they are considered strategic for economic development (Fernández-Maldonado & Romein, 2012; van Geenhuizen, Soetanto, & Schoeten, 2012). The concept of academic entrepreneurship - or the third mission of university - arises in this context (Breznitz & Feldman, 2012; Ramos-Vielba, Fernández-Esquinas, & Espinosa-de-los-Monteros, 2010; Teixeira & Mota, 2012), reflecting the need to establish a close relationship between academic research and private sector R&D activities (Carayannis & Campbell, 2011) because companies increasingly need new knowledge to innovate and to increase their competitiveness (Ramos-Vielba et al., 2010) and universities need to obtain additional funding for research and consolidate strategic positions in innovation networks (Tijssen, 2006). In most cases, these links are physically reflected in structures such as spin-offs or start-ups (E. G. Carayannis, 2013; Chen & Kenney, 2007), often organized in business incubators (Chen & Kenney, 2007). Science and technology parks are planned venues that have spread in Europe in the last almost fifty years, where training, research, development activities and production occur in a combined and symbiotic manner (Fernandes, Trigal, & Spósito, Fevereiro 2016). Science and Technology Park of University of Oporto (UPTEC) is internationally recognized as an important innovation ecosystem that promotes entrepreneurship and networks between R&D centers, private sector, local government institutions and organizations of civil society. Cultural and creative sector are becoming increasingly important in urban economies (Freestone & Gibson, 2006). Allan Scott argued, in 2008, that cultural production activities were among the leading sectors of economic growth and innovation processes (Scott, 2008). In Oporto, like in most European urban areas, the cultural dimension has become increasingly important, in recent years, not only in the context of public policies and strategies, as well as on initiatives promoted by academic institutions. Exploration of potential of creative industries, of production of new materials and innovative technologies and of creation of new competitive advantages in sectors related to the production of consumer goods with a strong design component are also an objective of smart specialization established to the Northern Region of Portugal. And the city of Oporto has resources and skills to meet this goal. Academic Entrepreneurship: Also known as the university's third mission, the concept reflects the need to bring academia and private sector R&D closer together. It is about boosting the economic value of processes of transfer and application of knowledge between university and business fabric. Entrepreneurship: The scientific literature explains it as being the product of the characteristics of individuals and of territories in which they are inserted. Individuals may be more or less likely to risk business opportunities; territories may have conditions that facilitate or, on the contrary, that hinder entrepreneurship. Science and Technology Parks: They constitute a structure for the development and transfer of technology and for carrying out academic research with industrial application. They represent academic entrepreneurship, being spaces that respond to the objective of effective integration between science, industry, and technology. Cultural Economy: The concept emerged in the mid-90s of twentieth century in the social sciences. There has been a broad discussion around a precise definition and its composition in terms of sectors of activity; however, it is a concept to which is assigned different meanings. In some cases, it contextualizes the cultural and creative industries and in other it relates to the economic exploitation of the culture of a society. And in another case, it means both. Start-Up: These are small, newly created companies which, as a rule, have a strong technological component. They are in process of development and insertion in the market, seeking to do so through an innovative business model. Smart Specialization: Promoted by European Commission in the framework of Europe 2020 strategy, the objective of this strategy is to enhance the unique characteristics and assets of each country and region, making them competitive advantages over other territories. Incubation: Process through which companies develop their business plan and strengthen their position in the market, increasing the portfolio of clients and densifying their network of professional contacts. It takes place in structures for this purpose, among which are the science and technology parks.